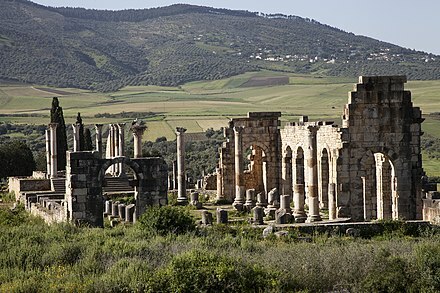 The Idrisids (Arabic: الأدارسة‎ al-Adārisah) were an Arab-Berber Zaydi-Shia dynasty of Morocco, ruling from 788 to 974. 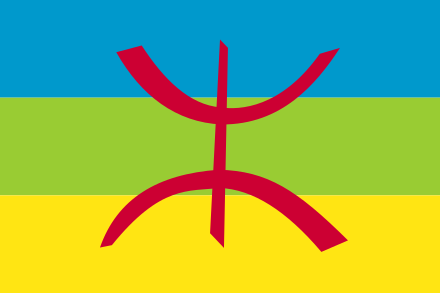 Named after the founder Idriss I, the great grandchild of Hasan ibn Ali, the Idrisids are considered to be the founders of the first Moroccan state. Morocco profited from the trans-Saharan trade, which came to be dominated by Muslim (mostly Berber) traders. Fountain at Place Nejjarine, Fez, dating from the Idrisid dynasty. Idrisid coin, minted at al-'Aliyah (Fez), Morocco, 840 CE. Jbala region they had a stronghold in the fortress of Hajar an-Nasar, from where they tried to restore their power base, until the last Idrisid made the mistake of switching allegiances back to the Fatimids, and was deposed and executed in 985 by the Cordobans. Idrisid dynasty that reigned for almost two hundred years." Fatimid empire, as well as several Berber confederacies that maintained autonomous rule in neighbouring territories" ^ a b Idris I, D. Eustache, The Encyclopaedia of Islam, Vol. III, ed. B.Lewis, V. L. Menage, C. Pellat and J. Schact, (Brill, 1986), 1031. ^ Idrisids, D. Eustache, The Encyclopaedia of Islam, Vol. III, 1035. Ibn Abi Zar, Rawd al-Qirtas (contains a chronicle of the dynasty). Charles-André Julien, Histoire de l'Afrique du Nord, des origines à 1830, Payot 1994. Wikimedia Commons has media related to Idrisid dynasty.